My "Christmas Birds" Killian and Kaleena and I send our best wishes for a very Happy Holiday season to you and your flocks! On the topic of holidays and gift giving, I'd like to tell you about Parrot Toy Angels, an all-volunteer organization committed to providing toys, food and other avian supplies to companion birds in difficult situations. Each year they have fundraising auctions on eBay, and it's a great chance to get some fantastic gifts (for your human and bird friends) and help parrots at the same time! 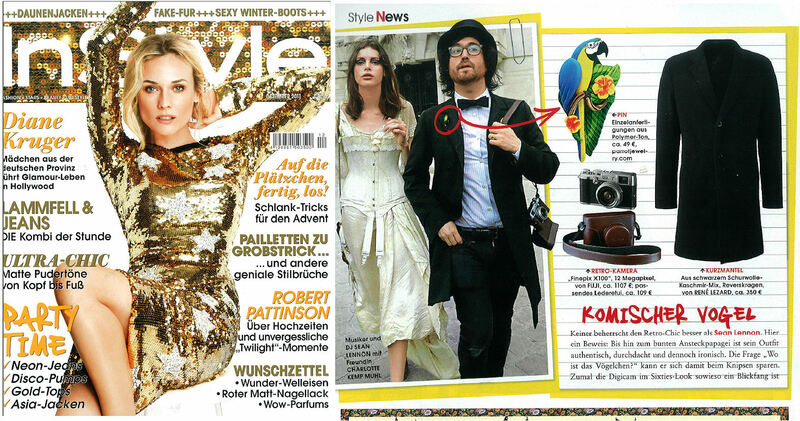 One of my parrot pins is featured in the December issue of German In Style magazine! It is the first time my parrot art has been featured in a "non-parrot" publication, so that was pretty exciting!